When I’m around the main shopping areas at Drottninggatan or around Slussen and I have the time and a roaring belly, I can’t really help getting a pretty healthy taco-fix. 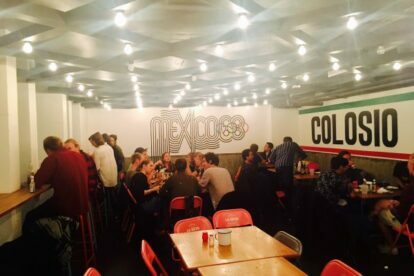 This is the place where you can find home-made tortillas with tasty fillings, authentic hot sauces and fresh coriander/ cilantro with plenty of veggie options too. I have visited Mexico / Central America a couple of times, I can tell you – more authentic and tasty is going to be hard to find around here. I really also like the fast-food concept. A quick bite before a movie, a concert, in-between meals or for lunch – it’s always a good time. I order at the counter where the tortilla and taco dishes are made in front of my eyes; I pay, get a buzzer and by the time it beeps, I’m overly excited to pick up my order. There is also a La Neta on Östgötagatan 12B by Slussen, and the opening hours are similar.